For National Patient Safety Awareness Week, your emergency dentist in The Colony wants you to know the best ways to keep your mouth healthy and safe. Unfortunately, dental emergencies can happen out of nowhere, creating a painful and traumatic experience. While they aren’t completely avoidable, you can have some items on hand to prepare yourself for the worst. Keep reading to learn the best ways to handle some of the most common dental emergencies. Over-the-counter painkillers: You can keep ibuprofen at the ready, and many people use clove oil as an all-natural topical solution. However, never put aspirin directly on the affected area to avoid damage and pain. Dental floss: Sometimes a toothache can be something as simple as a pesky piece of food stuck in between your teeth. Use dental floss to dislodge this object and relieve your pain. Orthodontic wax: Even if you don’t have braces, orthodontic wax is a useful tool to have. If you lose a filling, you can use this wax to cover the affected area, which prevents it from future pain. Gauze: Sometimes a cracked tooth or other dental injuries can lead to bleeding. In that case, you can have gauze at the ready to reduce blood flow. Cold compress: A cold compress or a bag of ice is always a great item to have on hand. 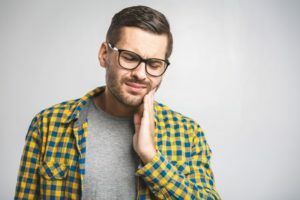 Many dental injuries cause painful swelling, which can be eased by placing a cold compress on the outside of the affected area. A number for your dentist/emergency room: While you may not know your dentist’s number by heart, it’s important to have them saved in your contacts to make calling quick and easy. Use these tips and items on hand to minimize damage and pain if an emergency does occur. If disaster does strike, remember to always call your dentist or emergency room right away to get the help that you need. Dr. Austin Amos is a Plano native who loves caring for his community. He believes in patient education, which is why he wants you to know the best ways to handle emergencies for National Patient Safety Awareness week. He currently practices at Ridgepointe Dental, and he can be reached through his website or by phone at (972) 625-4746 for any questions.